What to do when your tree "loses its head"? When a pool of stagnant water forms in its folds? When animals attack the tree you've barely just planted? It is possible to rise two lateral branches up by fixing them together, without using too much strength. When the new head will be stronger, you can eliminate one of the two branches. If a part of the old trunk remains, you can rise only one lateral branch and use the trunk to tie it up. Be sure to use the Styrofoam-covered pin to prevent injuring to branches. From your description, your maple has many heads. This is certainly not the ideal situation. A multi-headed tree is more fragile to breakage caused by winds. Regarding the water well, it would be better to leave it untouched. Some argue that we must drill and drive a drain pipe to drain standing water. However, research by Dr. Shigo on healing trees showed that puncturing the compartmentalization wall promotes the progression of decay in sound wood located inside the shaft. Fungi responsible for decay (wood rot) need air to survive. Water in the cavity blocks air and prevent their proliferation. Therefore, it is best to keep the water at the bottom of a cavity rather than out. When a tree naturally creates a pool of stagnant water, it is said to have formed a dendrotelma. You can see a video on dendrotelmata here, with the insects that call dendrotelmata home. Mice love the tender bark of trees and shrubs. As prevention, during the early years after planting, it is better to surround the trunk with a protective sleeve to prevent damage caused by rodents and mechanical appliances (lawnmower, trimmer, etc.). As for the survival of your tree, it depends on the amount of missing bark. If the bark is eaten around the entire circumference of the trunk, the tree will not survive very long because all its conducting vessels are cut. He will die after exhausting its resources. It is possible that it will still produce leaves and flowers from its nutrient reserves, but unfortunately it is condemned. What can you do? One approach would be to cut the tree to the ground. 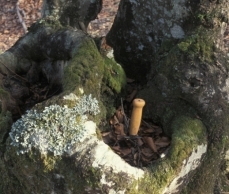 Maple trees often produce offshoots at their base if they are cut down. After a year, we keep the strongest one to regrow the trunk. Note that this approach applies only hardwoods. Few conifers are able to resprout so. If the bark is only partially consumed, sap can continue to circulate and trees rely generally quite good. It is not recommended to apply caulk or paint, because trees are able to heal themselves. Gradually, annual growth will overlap the wound. Remember that for all these cases, you can take care of your wounded tree by watering it, if needed, during periods of hot weather. An annual layer of spring compost is always beneficial too. This will help the tree indirectly in his healing process by providing ideal conditions during its recovery.